This is a statement of an agreed position produced by a meeting of key industry participants, individual practitioners, and organisations, sponsored by the Australian Council of Archives in Sydney on 23 October 1995. The purpose of this statement is to provide a common basis for Australian organisations – in the private or public sector, for use within the organisation or across a whole jurisdiction – to establish policy, standards and practical strategies for electronic recordkeeping. The organisations that have endorsed this statement believe that such a common position is essential for the development of an effective, coherent and consistent set of solutions to making and managing records in the electronic environment. As a summary of our common position, the statement provides evidence that initiatives consistent with it conform to widely accepted best practice in this area. It can be used or drawn on when developing submissions, business cases, policies, procedures and explanatory materials relating to electronic recordkeeping. This statement will help your organisation to establish policy, standards and practical strategies for electronic recordkeeping. It can be used or drawn on when developing submissions, business cases, policies, procedures and explanatory materials relating to electronic recordkeeping. All organisations need to document their activities: records provide evidence of business activities of all kinds. Accountabilities to shareholders, customers, regulators, ministers or the public are all documented through records. While paper still forms the most common medium for records, electronic media are replacing paper as the preferred means of conducting business transactions. Electronic transactions are no different in nature from their paper counterparts: they need to be recorded, captured in a fixed form, maintained and made accessible as records. Electronic records need to provide the same degree of evidence of business activity and the same level of accountability, and be able to function as social resources in the same way, as paper records, for the immediate and future needs of organisations, individuals and society. The role and purpose of recordkeeping in the electronic environment – electronic recordkeeping – are the same as in the paper world. Innovative use of information and information technology is supporting social and organisational change. The process brings many benefits and opportunities to business, government and society. Inevitably it brings risks. Electronic recordkeeping seeks to address the risk that there will no be sufficient evidence of business and social activity conducted in the electronic environment to meet organisational and individual needs. This involves meeting the challenges of recordkeeping in the electronic environment: to find the most effective means to create and capture electronic records, protect and manage them, and make them accessible for as long as they are needed. By the year 2000 all Australian organisations will follow guidelines and standards for the management of electronic records which are based on common principles, concepts and criteria. The strategies can be pursued by programs implemented in organisations, by the work of archives institutions, by research projects and by the efforts of individuals in their lives and work. Using this statement will help your organisation keep its corporate memory in the electronic age. Records are so ingrained and implicit in our methods of doing business that we are in danger of overlooking their importance and unique role in the electronic age. The electronic revolution, being experienced by all organisations, offers the opportunity to re-design business processes and methods. It provides a vision of easy access to all information across all the systems in our organisation and available from the wider world. But in seeking comprehensive corporate knowledge, we must also guard against the possibility of losing our corporate memory, that is, the trail of evidence of action that is provided by records. All organisations, whether private or public, and individuals in their working and personal lives, need records to document their activities. Records provide evidence of business activities. Without records, people and organisations cannot prove that actions have been taken, commitments entered into or obligations carried out. But records have a broader purpose than the immediate objective of getting business done: organisations exist within regulatory frameworks which impose various degrees of accountability for their activities. Accountabilities to shareholders, ministers or the public are all documented through records. Increasingly the world is conducting its business electronically. Businesses are seeking competitive advantage by using new technology to reduce costs, enhance products and develop new markets. Governments are seeking to give better value to citizens by using new technology to improve service delivery and the quality of public administration. Consumers increasingly expect products and services of all kinds to be available in electronic form. More and more, individuals expect to be able to conduct their business using electronic tools. the anticipation of the virtual office. The process brings many benefits and opportunities to business, government and society. Inevitably it brings risks. One of the risks is that there will not be sufficient evidence of social and business activity conducted in the electronic environment to meet organisational and individual needs. Records document social and business activity. They function as evidence of that activity which is captured, maintained and delivered for a whole range of current and future accountability and information purposes – personal, corporate, legal, social, democratic and cultural. Records are used by government administrators and business people, social watchdogs and regulators, auditors and legal professionals, and individuals in the full range of their roles, such as citizens, family members and researchers. the business domain: records are principally kept by any organisation or individual to support their business activities. Decision makers need records to provide precedent for subsequent decisions, to provide details of actions undertaken in case of challenge and to prove that required action was actually carried out. Service providers need records of dealings with customers to support claims for payment and to support further service. Individuals need records to ensure their entitlements and the obligations within and between organisations and families. Records support the furtherance of all business activities undertaken by organisations or individuals. the accountability domain: records are an indispensable ingredient in organisational accountability, both internal (such as reporting relationships) and external (to regulators, customers, shareholders and the law). Records show whether the organisation, or individuals in it, have met defined legal, organisational, social or moral obligations in specific cases. In all accountability forums, records are consulted as proof of activity by senior managers, auditors, Royal Commissioners, concerned citizens or by anyone inquiring into a decision, a process or the performance of an organisation or an individual. the cultural domain: when used for any purpose beyond the support of the business activity which created them, or accountability for that business activity, records may be regarded as becoming part of the resources available to society to account for its collective behaviour. The uses of records as social resource encompasses research into public health, environmental concerns, scientific endeavours or sociological questions. Records are also used as a social resource to support the study of history and historical trends as a part of public education or private research. Records are created and used by everyone in our society. While paper still forms the most common medium for records, electronic media are replacing paper as the preferred means of conducting business transactions. Electronic transactions are no different in nature from their paper counterparts: they need to be recorded, captured in a fixed form, maintained and made accessible as records. Electronic records need to provide the same degree of evidence of business activity, the same level of accountability and the same social resources as paper records, for the immediate and future needs of organisations, individuals and society. The role and purposes of recordkeeping in the electronic environment – electronic recordkeeping – are the same as in the paper world. helping organisations and society move from paper-based to electronic ways of working, bringing environmental benefits, cost savings and improved accessibility, services and accountability. ensuring that electronic records created and captured now will remain accessible and useable for as long as they are needed. building a culture of recordkeeping among managers and workers. 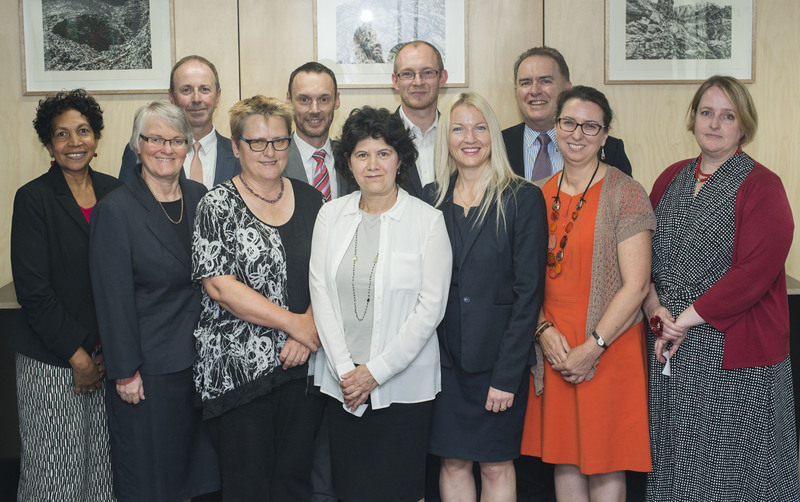 Information professionals from a range of disciplines will play key roles in the success of the electronic recordkeeping endeavour. the establishment of improved recordkeeping practices. Successful implementation of principles and strategies for electronic recordkeeping will require the informed support of senior management of all organisations. All individuals in organisations will be involved in electronic recordkeeping, responsible for ensuring that evidence of their business activity is created. From there, the recordkeeping professionals will be responsible for ensuring that records are successfully managed for as long as they are required. Organisations endorsing this statement commit themselves to pursuing our shared vision for ensuring evidence through electronic recordkeeping into the 21st century to be achieved through the broad strategic framework outlined in the rest of this statement. The principles and strategies outlined in the remainder of this document from a guide to enable pursuit of our shared recordkeeping vision. The strategies can be pursued by archives institutions, by research projects, through education, by programs implemented within organisations and by the efforts of individuals in their lives and work. They imply the need to involve many other professions and recognise the interdependence of recordkeeping with other information professionals. to project our professional commitment to the issues and challenges of electronic recordkeeping to others in our organisations and to the wider community. Regular reporting, the sharing of progress and the continual modification of our strategies in the light of experience will enhance the long term validity of these initial steps. Each organisation’s business processes and systems shall operate to capture records which provide evidence of its business activities conducted electronically. Responsibility for creating and capturing records shall rest with individuals nominated as responsible at all levels of the organisational structure and with the organisation as a whole. Each organisation should identify relevant and accountable recordkeeping requirements to determine what records are to be created or captured and how long they should be retained. Each organisation should determine, through risk assessment, the degree to which its different activities need to be supported by reliable and authentic records. Each organisation should define its own statement of the boundaries of business processes and systems, and the legal and other requirements that affect them, to facilitate the capture of business communications as records when entering or leaving the specified domain. Archives institutions should establish documentation strategies focusing on organisational recordkeeping approaches. Archives institutions should promote themselves to targeted records creators, demonstrating the benefits of documenting their work through electronic recordkeeping. The major objectives of electronic recordkeeping systems shall be to manage the content, context and structure of records as a whole and to ensure that records are reliable and authentic. Electronic recordkeeping systems shall facilitate the reuse of information contained within records while securely maintaining reliable and authentic records. Each electronic recordkeeping system shall be designed to comply with relevant national and international standards and best practices. Electronic recordkeeping systems shall provide one corporate interface to all records relating to a particular business activity, regardless of the media in which the records are created and kept. Each organisation should identify recordkeeping requirements to be satisfied by electronic recordkeeping systems, including operational business needs, legal requirements, industry best practice and the expectations of society. Each organisation should determine whether its requirements should be satisfied by one or more than one electronic recordkeeping system. Recordkeeping requirements may be satisfied through dedicated electronic recordkeeping systems or by designing and implementing recordkeeping functionality into systems not primarily designed for recordkeeping. Electronic recordkeeping systems should operate to comply with Australian Standard AS 4390, Records Management, and other relevant standards. Electronic recordkeeping systems should be regularly audited for compliance against the specified recordkeeping requirements. When implementing electronic recordkeeping systems, organisations should ensure that such systems are recognised and used as the authorised organisational recordkeeping system/s. Electronic records shall be maintained for as long as they are needed. Electronic records shall be maintained in electronic form. Each organisation shall maintain electronic records to ensure that the evidence is accessible, comprehensible and managed for as long as it is required. Each organisation should migrate electronic records of continuing value through successive upgrades of hardware and software in such a way as to retain the full functionality of the preceding systems and the integrity of the electronic records created in them. Each organisation should use each such migration as an opportunity to re-appraise the decisions to retain or delete electronic records. Appraisal should be undertaken rigorously at the time of designing the recordkeeping system or as early in the life of the records as is possible, to mitigate the need for continual migration of records at migration. Each organisation should identify, capture, maintain and migrate the metadata required for electronic records and the systems that create them, including contextual information about the records and the activities that they document, in conjunction with the records themselves. The connection between the records and the metadata should be should be maintained for as long as the records, including through migration of hardware and software systems. Each organisation should identify and adopt relevant technological standards that will help ensure that electronic records will be available and useable for as long as they are required. Each organisation should determine who will maintain and manage its electronic records of continuing value in an environment that is able to support the content, context and structure of the records over time. This may be the organisation itself, an archives institution or another organisation, that is, the custody of electronic records may be distributed, rather than in centralised archival custody. These decisions may be affected by external policy or other requirements. Each organisation should establish standards and procedures to ensure the integrity of its electronic records over time. Electronic records management should employ sound data management techniques. A variety of information management tools should be explored to facilitate the goals of electronic recordkeeping, including electronic document management and workflow tools. Each organisation shall aim to provide appropriate electronic access to records irrespective of their location, both within and beyond the boundaries of the organisation. Each organisation shall protect its electronic records from inappropriate access. Each organisation shall be able to provide access to electronic records in ways that will present meaningful evidence of the business activity that they document, in addition to presenting their information content. Electronic recordkeeping systems implemented within organisations should facilitate appropriate remote electronic access to records by employees and authorised external users. Archivists should work with custodians of electronic records to develop networked access systems that are available and easy to use, while protecting the custodian’s operational systems from unauthorised access. Governments and other organisations should consider the requirements for and provide access to electronic records in the development of information locator and ‘one stop shop’ services and systems. Archival information systems should serve as hubs for networked access beyond organisational boundaries. Archival information systems should provide on-line finding aids, standardised records searching and retrieval tools and compliance with access policies. Archives institutions in partnership with other organisations should pursue opportunities to enhance access to electronic records, including value-added services, through entrepreneurial and co-operative ventures.